Michael Egan (left) and Allen Turner try to diagnose an issue with a Cadillac SRX during a competition at MassBay Community College in Ashland. ASHLAND — The mental concentration in the large, concrete-floored room is almost palpable. Beneath fluorescent lights, pairs of students confer while an adult judge listens in, each team involved in its own problem-solving challenge. Were the setting a school cafeteria or gym rather than an industrial garage, it could be a science fair or a robotics competition. But this is a high school challenge of a slightly different kind. The 28 young people — mostly but not exclusively male — are students in automotive technology programs at area vocational schools, and the venue is Massachusetts Bay Community College’s Automotive Technology Center. Having qualified for this day’s statewide automotive competition by scoring well on a written exam, the students here are vying for a trip to compete in the National Automotive Technology Competition at the International Auto Show in New York City in April. Cars run on computers, and Ferris emphasized that to make them work, you have to understand both the hardware and the software: how to program a car’s computer system, but also how to rotate tires and replace brakes. Ideally, a technician should also be comfortable talking with bosses and customers alike, which is why one of the seven judging stations here tests the students’ interviewing skills. Other categories at the judging stations include engine mechanical diagnosis, steering and suspension, alignment, brakes, and electrical systems. Even research skills are important. “We used to flip through books in order to find repair information or study wiring diagrams. Now we’re accessing information on the web that can be constantly updated based on the changes to cars,” said George Panagiotou, director of automotive technology at Mass Bay Community College. Paul Perreault, an automotive instructor at Blackstone Valley Regional Vocational Technical High School, showed up to cheer on his students. He often works with the same kids for three or four years and knows what it takes to make a good automotive technician. “Back in the 1970s, it was just a matter of doing basic repairs to engines and brake systems. We still teach that. But cars now have so much varied technology; the kids have to be simultaneously good with their hands and good with computers. That narrows the field down tremendously. Plus you have to possess a strong work ethic. Concurring with this theory about what makes a good automotive technician is someone with decades of experience: Don Martin, owner of an automotive repair shop in Framingham. He’s the patriarch of a three-generation family of mechanics; his son now runs the repair shop and his grandson, Bailey, of Upton, studies automotive technology at Blackstone. Last year Bailey placed first in the junior division of the state competition; his grandfather is here to watch him try for another win. Martin is just one of many family members watching the event through plate glass windows in the waiting room, as proud as any parent at a skating or track-and-field competition might be. Barbara and Patrick Mancini of Shrewsbury are watching their son Evan compete for the second year. “Evan has always had an interest in cars, and he was attracted to the excellent automotive technology program at Assabet Valley [Regional Technical High School],” said Patrick. But their son’s career is still a few years off, Barbara Mancini added; like many of the students competing here today, Evan plans to go on to college to study automotive technology before he enters the work force. 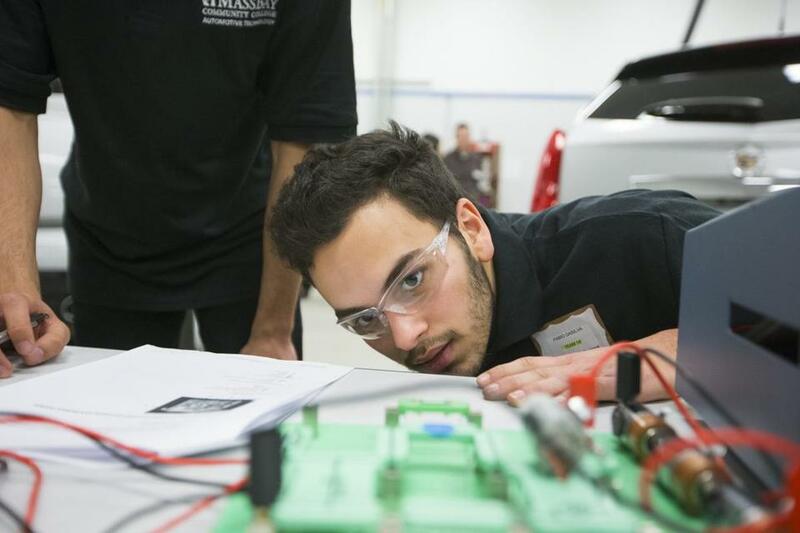 Fabio DaSilva, a junior at Assabet Valley Regional Technical High School, looks at an electrical board during the Massachusetts State Automobile Dealers Association competition at MassBay Community College in Ashland.